John E. McGrath is Artistic Director and CEO of Manchester International Festival. His first Festival in 2017 featured world premieres from leading international artists; a new digital direction for MIF; a series of participatory commissions in public spaces, and My Festival a year-round programme forging closer connections with Manchester communities. John was previously Artistic Director of National Theatre Wales, where he achieved a reputation for large-scale site-specific work, digital innovation and extraordinary community involvement. 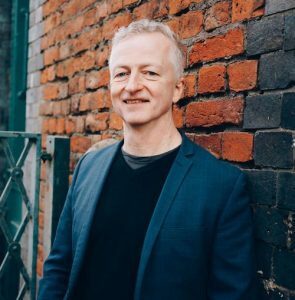 As CEO of MIF John will also be responsible for The Factory, a flagship cultural space for the creation of ambitious new work, opening in 2020. Overnight shifts in a New York summer loading coat rails in and out of hotels! Re-Imagining Contact and founding National Theatre Wales, but watch this space. Readiness to make a big decision on limited information, Ability to see things from the other side’s perspective, Ability to laugh at yourself. I can see the shape of things. The certainty of surprise, the joy of creating, the goodness of people. Heartbreak is good for your art. John McGrath joins Emerging Futures for The Big Debate – Leadership & Innovation, where we’ll discuss how cultural and creative leaders can harness progressive potential.